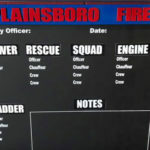 This custom assignment board was made for E50/L12 of the Philadelphia FD. It was made using air dried walnut which was sourced from Waynesboro, PA. It also features raised text on the top banner, a magnetic chalkboard writing surface, and their company logo. 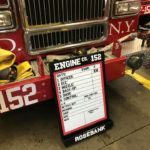 Firefighter owned and operated since 2005, Wall Shields Co. has been creating high-quality, handmade products for fire, police and EMS agencies across North America. © Copyrights 2017 by Wall Shields Co. All rights reserved.